Ever play the Chinese fortune cookie game where you add the phrase “in bed” to the end of every fortune? Lately, I’ve been playing that game with Governor Ducey’s hashtags, though I use the phrase “for special interests” instead of the other one. My game isn’t as hilarious as the fortune cookie game, but it does seem to sum up what the Ducey administration really means when it releases one of its cutesy hashtags. The governor’s newest hashtag, #ThingsThatMatter, was rolled out for his State of the State address on Monday, implying that his upcoming budget will prioritize the things that matter to all Arizonans. But history seems to suggest this recent hashtag will be no different than the many before it. Another gimmicky slogan designed to portray an image of a governor working for everyone, while behind the scenes, his team crafts policies that favor a clique of special interests. As an example, the governor’s first big hashtag, #OpportunityForAll, sounded oh-so-promising when it was launched during his first race for governor. Like many voters, I had assumed the “for all” was a reference to Arizonans who had been hit hardest during the Great Recession. Years after this hopeful hashtag premiered, our childhood poverty rate remains one of the worst in the nation, affecting nearly one in four kids. And our homeless population, which includes a significant number of veterans, is spiking instead of shrinking. Nationally, the homeless population has remained relatively steady, even decreasing in major cities. But in Arizona, it rose more than ten percent last year despite an improving economy. The state’s Housing Trust Fund, which was created to help offset rising rents and unaffordable housing, still receives tens of millions less than it did prior to the recession. Policies that fail to address high poverty and homelessness do not create #OpportunityForAll. Of course, some groups have definitely benefited from the governor’s policies, most notably corporations. According to the Arizona Center for Economic Progress, almost three-fourths of Arizona’s corporations pay the minimum $50 income tax. These special interests are flush with opportunity because of tax cuts and credits that have diminished their corporate tax liabilities to almost nothing. Another one of Ducey’s early hashtags, #ClassroomsFirst, inspired a similar sense of hope. I originally believed it was an attempt to secure more funding for schools, addressing low teacher pay or the abundance of desks crammed into classrooms. The #ClassroomsFirst initiative was just another scheme to shift around existing education dollars. 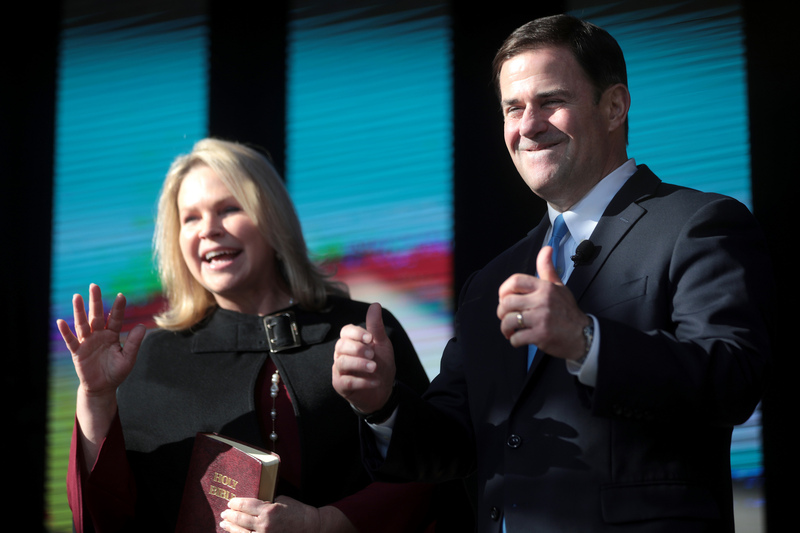 The plan was to revamp the finance formula, but not even Ducey’s handpicked Classrooms First Council could find a way to solve or mask a $1 billion education deficit. The chairman of the initiative went so far as to recommend a sales tax increase for public schools, something Ducey has vehemently opposed. But the governor eventually found a way to ensure some Arizona classrooms came first. His team unveiled a #FundTheWaitlist campaign to promote a policy that effectively placed more money into the hands of high-demand charter schools, ones that just so happened to have close ties to the governor. Since Ducey was successful in passing a performance-based funding initiative that favored special interests, perhaps he could use his bully pulpit and hashtag to fund the waitlist for childcare subsidies? Surely the governor is aware that more than a thousand families are waiting for assistance and that, without these subsidies, parents are put in the impossible situation of having to choose between a job and a safe environment for their kids. Isn’t that worth a hashtag, governor? There are so many #ThingsThatMatter to everyday Arizonans and those without high-priced lobbyists down at the Capitol. These things number in the millions and billions in missing funds for programs that actually #SecureAZ for future generations. What we need from our governor isn’t another corny hashtag but rather a vision that extends beyond the special interests in his close-knit circle. That’s how we make #AZAwesome for everyone.